Oh, wow!! 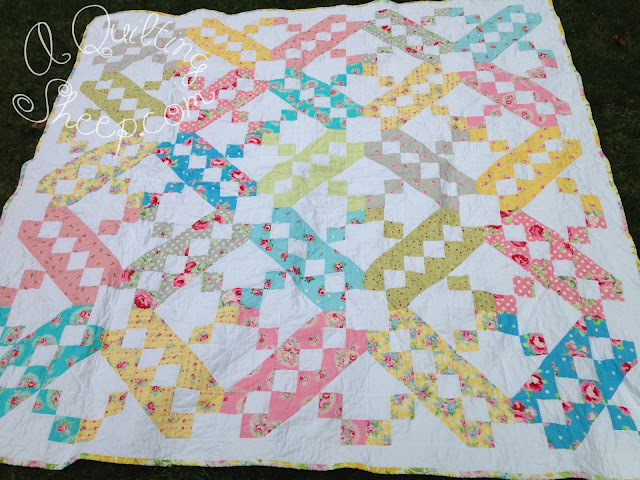 How I love how this quilt turned out!! I found the perfect vintage sheet for the back. Amy that is wonderful! It turned out beautiful with the sheet for your backing. I'll have to keep my eye out for my own vintage sheet like that. 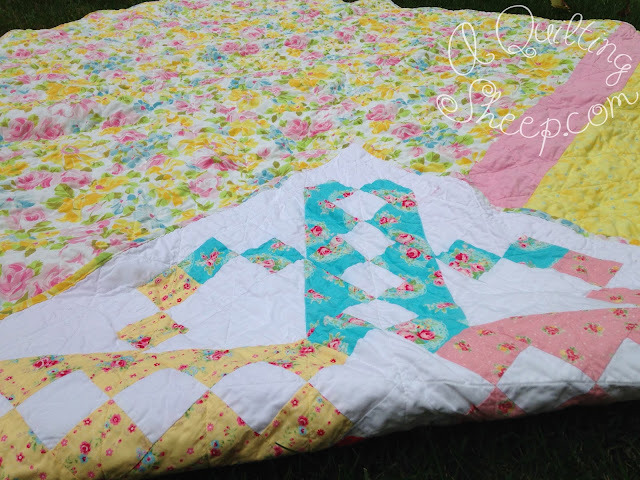 Oh my goodness Amy, your quilt is gorgeous! I really like the colors. Great pick on the backing too. Your quilt turned out beautifully. You are right the back is perfect. Oh I love this quilt. Love this quilt! and your back is so bright and vivied for a vintage sheet. It looks great! I love using vintage sheets on the back too! You DID find the perfect sheet for the back! LOVE it all! So very pretty. One of my favorite patterns. Hi! It's a beautiful Jacob's Ladder. Your fabric choices are perfect. .And the backing matches perfectly. I love it!!! I don't think you could have found a more perfect sheet if you had tried! It looks amazing, Amy! Oh Amy, I adore your quilt. The fabrics are just perfect! So very pretty. Oh my gosh, Amy, it's fabulous!! So, so pretty and the sheet is the perfect touch. I love it! This is a beautiful, perfect Jacob's Ladder, I love it! Amy, it's gorgeous! And yes that backing is absolutely perfect!! My oh my Amy! It is gawgous! I love love it. And I have that sheet. I have a double bed in the house so I can't bring myself to cut them up or use them on the bed. So they sit in the closet. But it is prob my most favorite vintage sheet sheet that I have. It looks beautiful with your quilt. ps.. for some reason you are showing as a no reply blogger? How cute! Another great finish! Oh, wow! I love this quilt too. Every Jacob's Ladder I've ever seen has been in dark colors--and even when I made several blocks years ago, they were dark. Your quilt is absolutely wonderful! 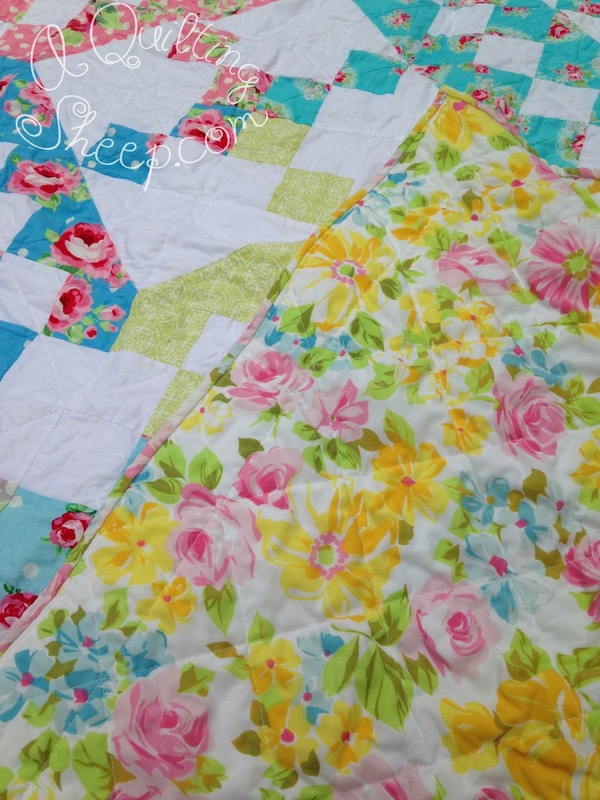 *SWOON* Oh my, Amy this is just gorgeous, and YES that is the perfect sheet for the back! Love it so much!